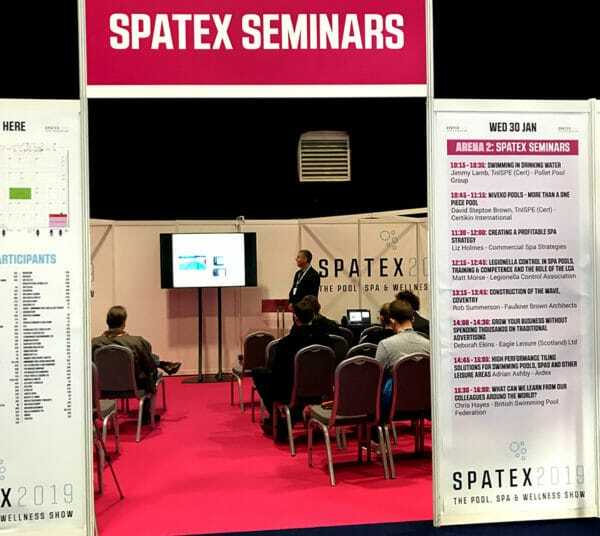 Alpha-Purify’s Head of Global Sales Berenika Bond attended Spatex, the UK pool and spa industry’s biggest networking opportunity, at the Ricoh Arena in Coventry at the end of January. The show represented an excellent opportunity to share knowledge and network with industry experts and meet with several UV disinfection OEMs who were exhibiting there. UV disinfection is increasing in popularity for treating the water in swimming pools, spas and aqua parks around the world, thanks to the fact that it deactivates all harmful microbes, including chlorine-resistant bugs such as cryptosporidium. Alpha-Purify manufactures high-quality medium-pressure UV lamps that are used in water disinfection around the world and supplies like-for-like replacement disinfection lamps for a wide range of OEM systems. Our visit to Spatex also highlighted the emerging trend for chloramine reduction using UV lamps. Chloramines are a by-product of chlorine water disinfection and cause the well-known smell, sore eyes and lung irritation associated with swimming pools. Exposing the water to UVC energy breaks down chloramines, ensuring those people using the pool or spa can enjoy the water without red eyes and a risk to their respiratory system. Berenika met with IBD Water Treatment Ltd, the newly appointed UK and Ireland distributor for the Danish company Ultraaqua’s medium-pressure UV systems who also look after the interests of VGE low-pressure systems in Ireland. If you would like to discuss your UV disinfection requirements with Alpha-Purify, please contact our technical sales experts by emailing info@alpha-purify.com or calling +44 (0)1327 368 205. Alpha-Purify to sponsor the Infection Prevention and Control Conference 2019 Find out why UV light is a key emerging technology for infection control in healthcare environments.